The sedimentary cycles of the Cenomanian to Maastrichtian were investigated in the Basco-Cantabrian Basin (BCB) in northern Spain (Provinces of Alava, Vizcaya and Burgos). The depositional area was a distally steepened carbonate ramp which extended from Catalonia northwestwards to the Basque country. The investigated sediments range from calciturbidites and pelagic marls to marl-limestone alternations deposited on a distal carbonate ramp. Shallow marine limestones, marls and intertidal clastics and carbonates were deposited on the proximal part of the carbonate ramp. The establishment of a regional sequence analysis is based on the investigation of seismic profiles, well logs and outcrop sections. Examples of outcrop sections are interpreted in terms of sequence stratigraphy (unconformities of third- and second-order cycles, depositional geometries, systems tracts). The sequence stratigraphic interpretation of outcrop sections is based on facies analysis, interpretation of observed depositional geometries and correlation of unconformities and marine flooding surfaces through the basin. A biostratigraphic framework is established based on ammonites, inoceramids, planktonic and benthic foraminifera. As a result, a regional sequence stratigraphic cycle chart is presented and compared with published global cycle charts. The correlation of the regional cycle chart with published cycle charts is good. In the Cenomanian and Turonian, several sequence boundaries in the BCB are shifted by up to one biozone compared with the global chart. Some type 1 boundaries of the standard chart are only type 2 in the BCB. Important type 1 boundaries in the BCB are: top Geslinianum Zone with a 100 m lowstand wedge at the basis of the sequence (sequence boundary 92.2) ; base Petrocoriense Zone with a 250 m shallowing-upwards lowstand wedge at the basis (sequence boundary 89.2); and within the Syrtale Zone (sequence boundary 85.0). The Campanian-Maastrichtian sequence record is strongly disturbed by local compressive tectonics. Several sequences are recognizable and can be correlated with the global cycle chart. Correlation is hampered by the low biostratigraphic resolution in the western basin part. 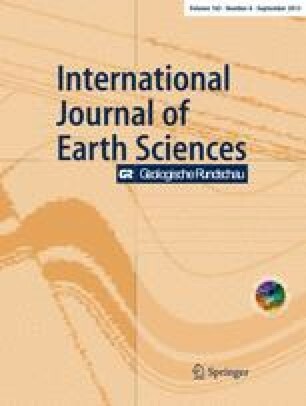 Subsidence analysis of several sections of the Upper Cretaceous of the BCB and its interpretation in the regional tectonic context leads to a discussion of the causes of the observed cyclicity. A regional eustatic curve is presented for the Upper Cretaceous of the BCB. Stage and substage names were used according Code-Committee (1977).